Hockeysfuture.com profiles BU sophomore defenseman Matt Grzelcyk, who is high on the Bruins radar after a strong freshman season and his recent stint at Bruins development camp. This Saturday, the blueliner from Charlestown, Mass., will be in Lake Placid for US Junior National Team evaluation camp. The last defenseman cut from last winter’s WJC team, Grzelcyk is a favorite to make the squad and play a key role, according to U.S. of Hockey’s Chris Peters. Brandon Yip, who holds the distinction of scoring the Hockey East Championship-winning goal twice (2006, 2009), signed a one-year contract with the Phoenix Coyotes. 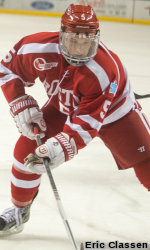 A 107-point scorer in his four seasons as a Terrier, Yip spent last season with Nashville, scoring 8 points in 34 games. Former BU All-American and St. Louis Blues standout Kevin Shattenkirk was named to the tryout roster for the U.S. squad that will play in the 2014 Winter Olympics in Sochi, Russia. Evaluation camp is Aug. 26 and 27 in Arlington, Va.
As previously Tweeted, Ben Rosen earned a silver medal with Team USA at the recently completed Maccabi games in Israel. Rosen scored 4 goals and 10 assists in five games, including the game-winner and three assists in the semifinal. He has signed a minor league contract with the Islanders' organization. OverTheBoards.com will post an evaluation of BU’s 2013 recruit class on August 12. The Web site’s series on recruiting has already featured Harvard, Holy Cross, Minnesota and Wisconsin. A pair of future Terriers, goalie Shane Starrett and forward J.J. Piccinich will participate in the USHL's Atlantic Challenge in New Jersey, Sept. 6-8. Six USHL teams, including Starrett's Sioux Falls Stampede, and Piccinich's Youngstown Phantoms, will each play three games in the tournament. (Details and schedule). Starrett played for the Select Hockey Academy at South Kent School last season, while Piccinich, a New Jersey native, is entering his second season with the Phantoms. Four Terriers were named to Team Canada’s U-22 selection camp, August 10-18 in Calgary. Shannon Doyle, Kaleigh Fratkin and Sarah Lefort also were invited to last year's camp. 2013-14 Terrier captain Louise Warren is a first-time invitee.